Motorized pool toys are fun for the entire family. Pick the perfect toy for pools, ponds, lakes, and the ocean. 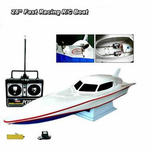 Shop our large selection of remote control boats, pool toys, and RC cars for sale.